Use our free Citrix XenApp 6.x migration tool to quickly switch to Parallels® Remote Application Server (RAS) and start leveraging the most cost-effective, highest-performing, and easy-to-use VDI and application delivery solution. Parallels RAS is a cost-effective VDI and application delivery solution that allows employees to access and use applications, desktops, and data from any device. It’s easy to deploy, migrate, configure, and maintain. It improves security and compliance requirements and reduces total cost of ownership (TCO). The migration process from XenApp 6.x to XenApp 7 is lengthy, complex, and in most cases requires consulting services. Many times, customers are forced to migrate due to increasing support and software maintenance costs. Migration to Parallels RAS is quick and simple—and now with our migration tool, it’s completely automated. Download the infographic. Provide users with instant and secure access to applications and data on any device. Allow Windows native apps to interact with iOS and Android touch gestures. Applications, data, and desktops are accessible from any HTML5 browser without local Parallels clients installed. Help replace paperwork with a simple and secure medical IT system allowing Healthcare organizations to securely access EMRs from any device and any location without compromising HIPAA and PCI-DSS. Deliver user performance by effectively distributing end user traffic and workload across multiple gateways and RD session hosts. Parallels RAS components can be deployed in multi-active/passive or multi-active/active mode, and are load balanced, reducing the risk of downtime while providing a seamless end-user experience. Allow users to print documents and forms from devices of choice: Windows, MacOS, Linux, iOS, Android, or HTML5 browsers. Scaling up Citrix XenApp is complex and requires additional licenses, financial resources, and often third-party technical expertise.party technical expertise. Retain all the features you need at the fraction of the cost. Parallels RAS offers savings on licensing and doesn’t require expensive add-ons, such as NetScaler, therefore reducing TCO. Fast ramp-up for IT staff thanks to our free training and intuitive management console. 자세히 보기 about how switching to Parallels RAS can benefit your company. The Parallels RAS migration tool is a free, automated way to easily help customers switch. The tool can be used alongside our comprehensive migration guide. NOTE: The Parallels Citrix XenApp 6.x migration tool is a standalone software executed on a separate management workstation. It won’t modify any settings on your existing Citrix XenApp Farm. The configuration settings are extracted from the Citrix Farm using Citrix PowerShell SDK. 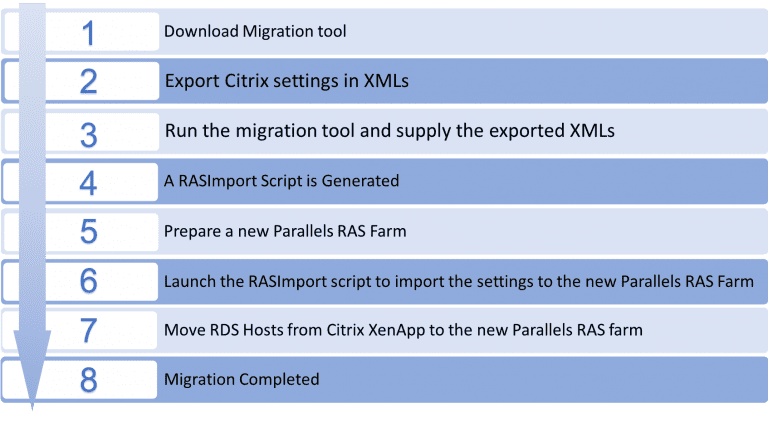 The Parallels RAS migration tool then imports the settings into a new Parallels RAS Farm. The administrators can then verify the new configurations and start migrating the Microsoft RDS servers from Citrix XenApp to Parallels RAS. Prior to moving to production, it is recommended that IT administrators review the configuration that was imported to the Parallels RAS environment and finalize settings by replacing Citrix XenApp worker role with the Parallels RAS RD session host agent. The Parallels migration tool for Citrix is available for the community to enjoy on Github at github.com/Parallels. Download a full-featured, FREE 30-day trial today. Are you caught up in the Citrix whirlwind of never-ending costs, complex implementations, and time-consuming maintenance? Put a stop to it today! Easily deliver Windows applications to anyone, anywhere using any type of operating system, computer, or mobile device. Parallels Remote Application Server delivers virtual desktops and applications from a central location, providing continuous availability, resource-based load balancing, and complete end-to-end reporting and network transparency for administrators.